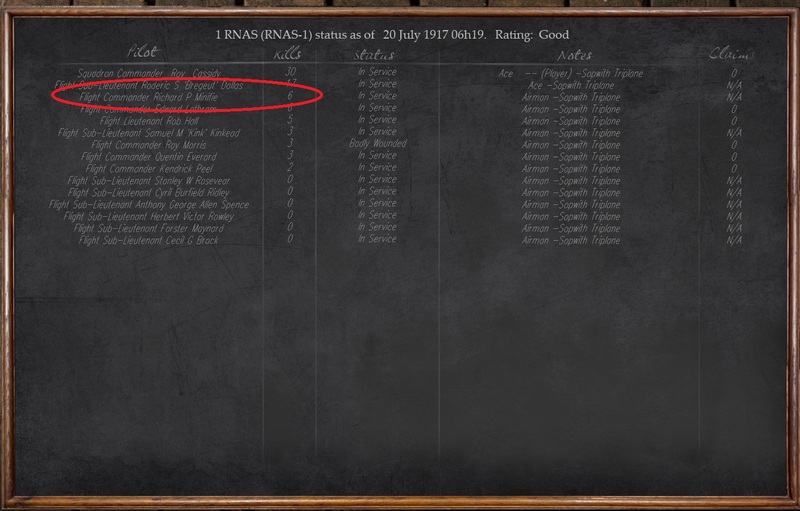 I have modified this first post to attach my Historical Victory mod versions here. This modification adds almost all British, Canadian, South African, Australian, French, American and German aces victory information files, short biographies and photos that are missing in WOFF database. All Commonwealth, German, American and French aces in the game have their proper scores and they will update historically as you fly with them. No more “N/A” in the Duty Room. The mod will be updated periodically as I can get my hands on new information sources. This version focuses on pilots with 5 or more victories, although many non aces have been added too, in order to have all squadrons update historically, when possible. I feel it will improve the sense of immersion and historical authenticity of WOFF. Thanks to Shredward for all the help and corrections. Enjoy, and post your impressions, or bugs you may notice in this thread. Last edited by ArisFuser; 08/26/18 09:03 PM. Great idea, ArisFuser! I was thinking about the same but I do not have sufficient access to historical data and enough time to implement it into WOFF. But you can freely add this data to WOFF and release it publicly as a mod (if you are so kind, of course). Do not forget to save any new kills file as "PilotsnameKill.txt" put link to it into related Aces file. If you have any question or experiece any difficulties, let me know it. I would like to see those additions in WOFF. Thanks Jara, I will definitely give it a try and post my headaches here , Děkuji! Super, Aris! You are welcome. Note, pls, my correction to text assignment above. I made a little error. It´s time consuming but it ´s worth it. Seeing your squad mates victories update historically adds to the realism and inmersion I think. Last edited by ArisFuser; 03/24/18 10:44 AM. Will be anxiously awaiting the mod for all 2000+ Aces in the game. Nice work gentlemen, this adds a lot more realism in you squadron. It’s no fun to see an historical ace at the bottom of the leaderboard If he already has confirmed kills to his name. Lol, next weekend sounds like a too optimistic timeline, 3 weeks is definitely more realistic . For a single person, not retired, this could take a lot of time! Last edited by ArisFuser; 03/24/18 12:54 PM. 35 pilots already done today. RNAS 1 and 9 complete. Last edited by ArisFuser; 03/24/18 07:32 PM. Fantastic find, Aris! I look forward to following your progress. One hundred new aces already done. This is one crazy task to do for sure! Jasta 4, 5, 6, 10,11, 18 and RFC 1, 46, 57, RNAS 1 fully modded. At this rate I hope to release a first preliminary Mod in about two weeks and keep on adding "packs" time permitting. Last edited by ArisFuser; 03/25/18 08:11 PM. DiD campaign pilot Aldi Schwarzkopf from Jasta 18 salutes you on this initiative. Way to go! Hals und Beinbruch! Great initiative Arisfuser, Good luck and Thank you for your work! Martin Zander´s first victory was in 1915 but on unknown day and month. I could invent any date and by 9 Sept 1916 he would have 3 victories already. That "Null" value doesn´t allow his score to increase. There are not realistic ways to solve the problem I guess. Last edited by ArisFuser; 03/26/18 03:01 PM. I would add a dummy date 1.1.1915 to enable his score count. Ok, done. Thanks for the heads up Jara. Nice! Let me know if there is anything I can do to help and point me in the right direction for research sources, etc. Thanks guys for the help. This is an Herculean task that should be done with a "little" patience and 125 litres of black coffee Today almost finished all the Blue Max recipients which were missing in the database. ( by the way, that means that all of them scored more than 20 kills that must be all written down!) Shredward did the tough ones, the Top Aces, but still lots to be done. Edit: I have found an annoying problem when inserting some ace victories. Some aces victory files are not recognized by WOFF even after linking them inside the game. I don´t know what am I doing wrong but I think It´s enough for today. Last edited by ArisFuser; 03/26/18 07:19 PM. ArisFuser,I just wanted to personally say a massive thanks for making a start on this "Herculean" task as you so rightly put it. I couldn't even begin to imagine the size of the task. Thx, Shred! What amount of details. Have you been in the same flight? Let me check that, Aris. Thx for info. BTW, is that true for all aces or is that valid for any particular person? True for all of them as far as I can tell. Thx for infor, fixed version available here. Thanks Jara, this is going to be really useful for modding purposes. Glad I can help, although indirectly. For those ace victory files that the simulation is not recognizing, I am sure Shredward would be able to help you, even if you were only able to PM him with the relevant files, so that he could insert them into the simulation via a later patch. Apologies for volunteering you, but I am sure you would appreciate the help that ArisFuser is giving you in completing this herculean task. This work is all about finding good sources of info, and taking yout time of course. The more information you get the longer the process. 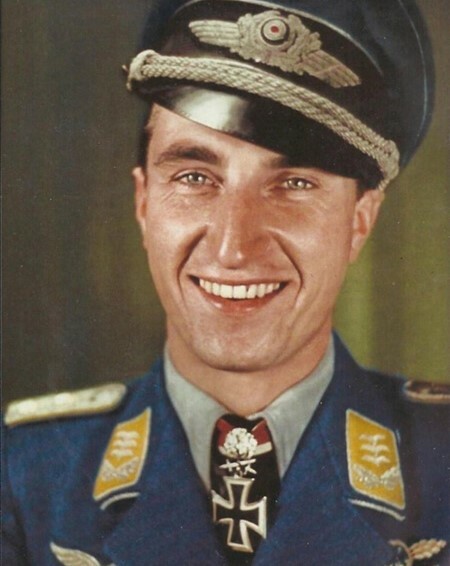 125 german aces "fully" done (including bio and sometimes photos). Not much done today, (you know, life still out there...) but I plan to send Shred some files for check and approval, hopefully tomorrow. 200 German aces ( including pilots with fewer than 5 victories, who are specially difficult to implement) already added ( or improved with new info), including biography (when missing), victory list (using Rick Duiven´s Datafiles, VanWyngarden and Henshaw books, ) and photographs from scanned books of my collection when lacking. Jastas 1, 2, 3, 4 ,5 , 8, 10, 11, 12, 15, 17, 18, 22, 26, 45 (and some others I may forget now...) fully done from 1914-1918. Last edited by ArisFuser; 03/31/18 09:28 PM. Agreed. When it was mentioned “make a mod” I thought it was a joke. But it’s really gonna happen. And incredibly cool at that. There are 906 german pilots in the database (many of them without any victories though), so there is a LOT to be done yet. ArisFuser, incredible work! I remember asking the devs about this a long time ago. It seemed an impossible task but for a handful of aces, but you are blitzing through them! Big thanks for all your hard work! Work goes on smoothly, at this point, at least regarding german pilot database, things are really beginning to take shape. 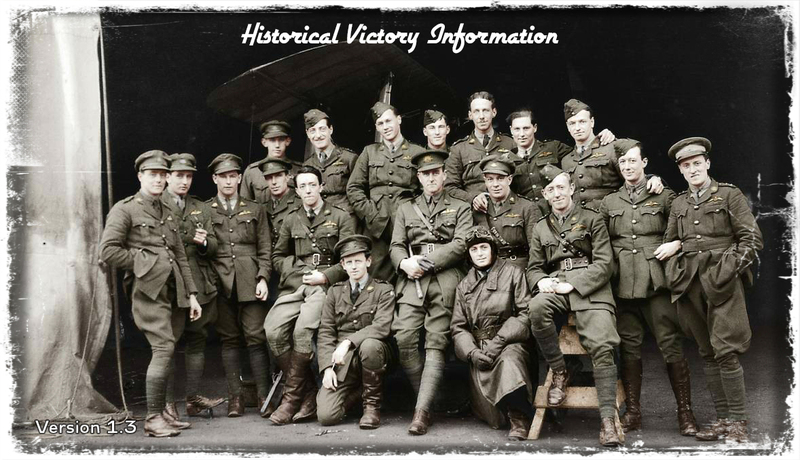 350 completely new pilot Victory lists added, 200 new biographies and several photos. Shredward created a monster database with the love and dedication of a WWI passionate and the strictness of an historian but at this point I am afraid some data will be impossible to include in the mod, specially biographies. Even the tiniest piece of information about some pilots is impossible to find even for historians (sometimes is hard even for aces!). Anyway, I hope to have beta a mod * that ,hopefully, will increase the inmersion factor while keeping historical fidelity as high as possible in about a week. ( yes, 7 days ) . * This will be my own personal mod, that will include minor fixes by Shredward but will not be official in any way (not yet, at least, if ever), so it will not be endorsed or supported by OBD. Last edited by ArisFuser; 04/05/18 08:01 PM. Thx, ArisFuser. Looking forward to include your work in my WOFF installation. You are another of the dedicated souls here. Many thanks from me. I can't wait to see the results. This will really up the immersion factor! Ummm, this is the awesomest of awesome things! I applaud this effort. Cheers!!! ArisFuser, a belated but sincere thank you! This is a wonderful addition. I'm curious whether, when the victory information is present, the WOFF campaign engine can show the correct current victory count for the current campaign date when you look in the duty room. I have a copy of "Over the Trenches," which gives at least a brief bio of the 5+ victory RFC, RNAS, and RAF aces. PM me with names if you're missing some. My time is bit limited but I can help. Yes, it will count correctly in respect to mission date. Thanks for the help Raine. As Jara said, the campaign will show victory information for current date when you look in the Duty room, so it will update historically. 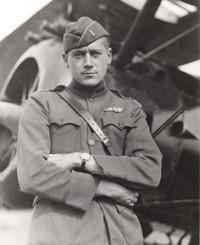 Regarding ace biographies, at the moment, I have some valuable sources for pilots with 5 or more kills, the problem is for those that scored 1,2 , 3 or 4. I will try my best but limitations are obvious when looking for almost anonymous guys born 120 years ago. Wow, this is quite an accomplishment. Well done! Congratulations and Thank you for this great mod! This Will add a lot more realism into this already great sim. Thank you, Sir! Drinks are on me! Thank you for this, ArisFuser! This one is going straight to my list of enabled mods! Outstanding! Thank you Aris. Any chance to get this in a zip or rar format? I’m not too fond of the exe’s. First rate service. Thank you, sir! I have modified this first post to attach my Historical Victory mod versions here. The readme points to this thread, so I hope this will make things clearer. It´s a JSGME ready, exe file. This modification adds almost 500 victory information files, 250 short biographies and several photos that are missing in WOFF database. 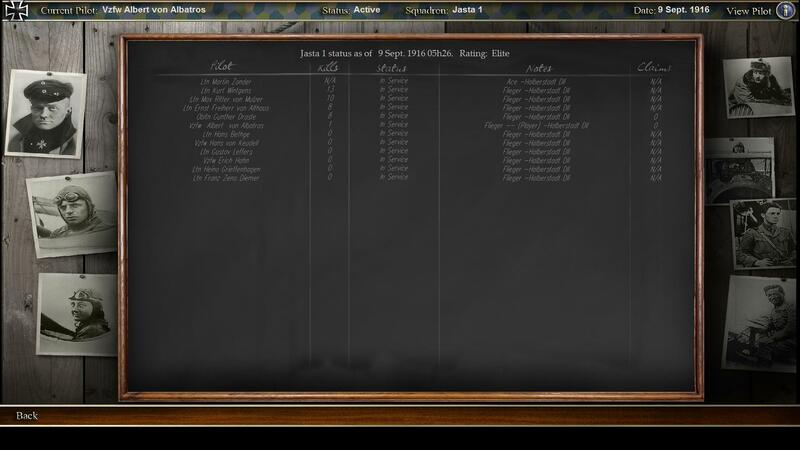 All german aces in the game have their proper scores and they will update historically as you fly with them. No more “N/A” in the Duty Room. The mod will be updated periodically as I get my hands on new information sources. This version focuses on German pilots with 5 or more victories, although many non aces have been added too, in order to have all Jastas update historically, when possible. Allied aces will come later. The task has been daunting but I feel it will improve the sense of immersion and historical authenticity of WOFF. Thanks to Shredward for all the help he has provided. Well, enjoy, and post your impressions, or bugs you may notice in this thread. 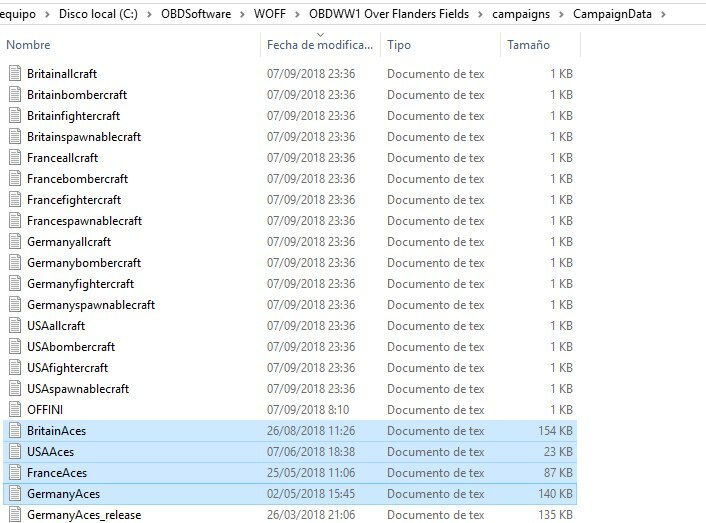 It would be nice if OBD ported your mod directly into the next WOFF update as a permanent part of the sim. I have added 150+ british and german pilot bios and victory lists since 1.0. I have fixed some errors I have found both in the mod and in the original. I don´t want to release new versions too quick, it gets burdensome to add mods and be up to date otherwise, but expect regular updates. Aris, this is much appreciated. I have the book 'German Aces of World War I- The Pictorial Record' by Norman Franks and Greg Van Wyngarden. It has the pilots' ranks, score and main units to which they were assigned. Most pilots have a photo but a few don't. If I can be of any assistance looking up a German pilot then don't hesitate to PM. Does that book give information about pilots with less than 5 victories? Biography or victory lists? Aris, I have that book. It has nothing for those with less than 5 claims. Ok, thanks Shred. I will try to find other sources then,...At the moment I have already modified/created 1000 files, and expect to have version 1.1 next week with all American pilots with 5 or more victories added and many french and british too. Okay! I was under the impression you were looking for 'aces' only and would put in the 'non-ace' record if came to light. The book 'The French Air Service War Chronology 1914-1918, Day to Day Claims and Losses by French Fighter, Bomber and Two-Seat pilots on the Western Front' by Frank Bailey and Christopher Cony along with its counterpart 'The Jasta War Chronology, a Complete Listing of Claims and Losses, August 1916 - November 1918' by Norman Franks, Frank Bailey and Rick Duiven would be your ticket if you don't have those! I might be mistaken but thought there was a British counterpart to the previous books mentioned but I cannot find it. At any rate, these two books have pilots' claims even if it was only one. Again, I'd be happy to help. We have both of those. However, the data in those has to be checked and compared with other sources, as it's not always accurate. It is a very big task, just takes time. Version 1.1 uploaded in the first post. Last edited by ArisFuser; 04/21/18 07:16 AM. Thanks, Aris, for your continued work updating the historical pilot database. It really ups the level of immersion when you realize that many of your fellow pilots were once actual living, breathing human beings rather than just a collection of computer bits and bytes. I look forward to any additional updates. This may seem like an odd place for a first post. I've been collecting the wherewithal to play WOFF for quite some time now, and planned on joining the forum very soon anyway, when a friend turned me on to this thread. I don't know if I can help or not, but I do have the day-by-day Jasta Chronology and French Air Service Chronology by Norman Franks and friends. I also have his three 'Under the Guns' books. Both of these have some good information, especially the Chronology books. I only wish he had done the same with other nations. If there is anything I can contribute, please let me know. I'll be posting more in all the forums as I get set up to play. Thanks for the help and welcome to the forums Steve. At the moment I am in the middle of a well deserved rest. After so many data collected and added I needed to stop and come back refreshed. But soon, I will be asking people in this thread for info about specific pilots or hard to find info. So, again, thanks for your willingness to contribute. I can truly empathize about the rest. I've been a part of SubSim's '100 Years Ago Today' project since the beginning, which is what prompted me to buy these books in the first place. I've been chronicling both the aviation and the u-boats. With "Bloody April" last year I found myself having to drop the u-boats. These days just logging the air battles is taking up to six hours of almost every day. I won't see the end of that until November, and to be honest I'm looking forward to it. Enjoy your rest. Did I mention “you’re awesome”? I am to release version 1.2 next week (or the next one). I will try to include all french aces for this version. Hundreds of french aces! Wow. Allow me to fawn at your feet and say you’re “awesome” again. Version 1.2 available in the first post. Incredible effort! Many thanks ArisFuser for this labor of love! Aris, thank you for this monumental effort. I owe you a beer. I've finally been able to start playing WOFF, and being pedantic I started as early as it would let me, which so far was March 20, 1915. Now, looking at my squadron list (MS 3), I begin to see what you've all been talking about. My Escadrille shows two aces on the roles, at a period before there was one ace anywhere in the world! Does the game auto-generate "previous kills" for the pilots it creates? If so, I'd love to see that part go away. My first post, just two above this one, shows me offering to help and saying I have the two day-by-day books, for the French and Germans. Now that I've sat and read the thread in its entirety I see that just a couple of posts above mine Shredward says he already has those, and has been sorting and comparing information. I feel a little silly now, but I'm still willing to help any way I can. This looks like quite the project, and now I understand what's going on I want to see how it all turns out. And I'd like to be a part of it. I downloaded the file but could not unzip it (7-zip says there is a problem with the file). The download and zip worked just fine for me a couple of minutes ago. Wow! What a piece of work. Unzipped fine for me and seems to be causing no problems. I'm flying in Jasta 8 in August 1917 and Gottsch, who had one victory, shot up to 14 and now is right on my heels! Oh! And the colorized head shots are a very nice touch. I have been out for the last two weeks so work on this mod has been slow. So far Britain aces are pending (of which I have already added more than a hundred) but I can see the light at the end of the tunnel. Once finished I will post the final version here. Just posting here for whoever may be interested. This newbie is also interested. For several years over the past decade I worked on a similar project for Silent Hunter III involving historical names for ships sunk. I've slacked off in the past few years, but with almost thirteen thousand ship names I feel somewhat proud. I've played 3D airwar games with models for several decades now, but since Red Baron I haven't played a computer WW1 sim. WOFF has me very excited and this super mod is such a great concept. I'm glad to see someone actually doing this. almost thirteen thousand ship names I feel somewhat proud. Somewhat. Seems like a good start to me. This mod is getting ...BIG. An ardous task if you ask me. Last edited by ArisFuser; 08/15/18 09:29 AM. Unfortunately, auto generated pilots show random kills I am afraid. I am unable to change that. Historical aces will show correct info though. Last edited by ArisFuser; 08/15/18 09:52 AM. Thanks for taking the time to respond. I can understand that. It's a minor thing anyway - just something I noticed. So far it hasn't lessened my enjoyment of the game. sorry if this has been answered already... how do you extract this? I can't seem to extract it with any of my programs in Windows 10 or ... <cough> Windows Vista. my install of 7zip didn't work the first two times I tried it-- but then I remembered it's a 10-year old version of that program. so I'll try updating 7zip and give it another shot.. thanks ArisFuser and dutch. Version 1.3 is ready in the first post. This version adds hundreds of Commonwealth aces (although some are still missing). The mod is almost finished. Last edited by ArisFuser; 08/26/18 10:04 AM. Many thanks for all your time and effort with this indispensable add-on! I'm starting to think I'm too stupid for this. The link works fine. 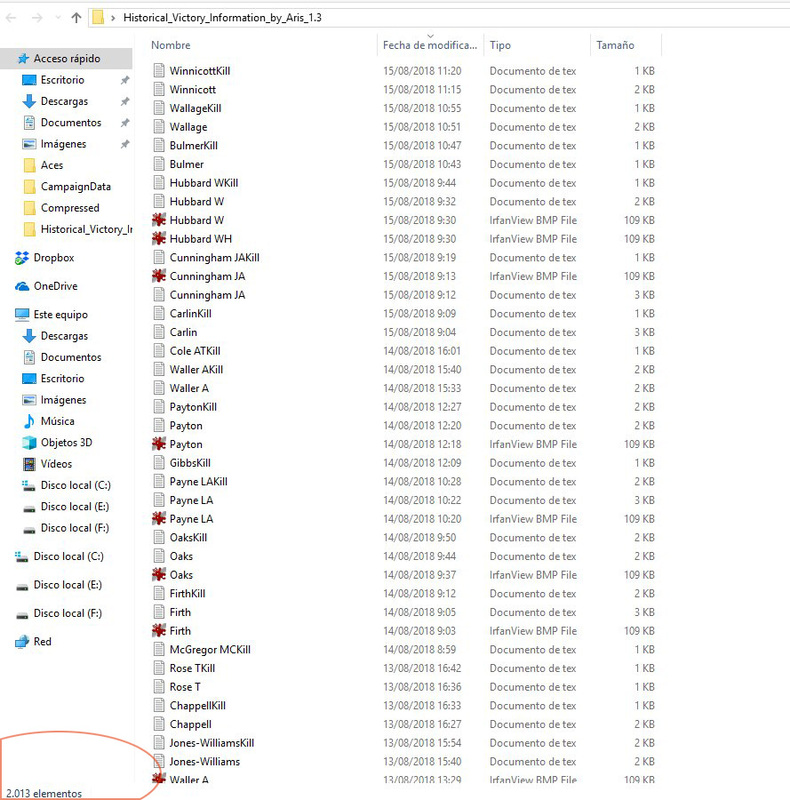 If I click on the file it opens the folder, just like if I had downloaded it. But it's still in DropBox, not on my computer. If I right-click it I get a bunch of things I can do with the link. None of them actually downloads the file onto my PC. If I right-click and select 7-zip (which I've used a lot) it doesn't ask if I want to open the Archive, just if I want to add it to the Archive, which means it isn't zipped. I'm missing something, but I have no idea what. I have uploaded a zipped file in the first post. Last edited by ArisFuser; 08/26/18 04:11 PM. Thank you Aris! Much appreciated. I'm still not getting it. I don't see any way to download it. That's where the RAR file is. You can now unzip it (or unRAR it) and place it in the correct directory, following the structure in the RAR'd file. I will try to find an easier to download link later today. Added a new link in the first post, hopefully this will make things easier now. Okay, now I'm feeling extremely stupid. ArisFuser, thanks for taking that extra step. I had no problem with downloading from there at all. Thanks to both of you for helping a blind, stupid old man to get this great mod. I already had v.2 installed. and now I'm happy as a clam. Last edited by Sailor_Steve; 08/27/18 02:06 PM. Well, in your defense, took me a few moments to figure it out also. Think they changed the format as it used to be very simple. I can download the .rar file but 7-zip won't extract it for me. Get error message "Can not open file ""C:\Users\randr\Downloads\Historical_Information_1.3_by_Aris.rar" as archive. Same problem I have had all along (i.e. with previous versions). FWIW 7-zip work just fine for me. This gave me a clue that my 7-Zip was out of date. Updated it and now it works. Thanks! !